At the Santa Cruz Fruit Tree Project we’re serious about shifting away from fossil fuels. In addition to reducing food waste and promoting local food production, we organize most of our events around walking and bicycling, and use a lot of human-powered and solar-powered equipment. In fact we build a lot of it ourselves. Here’s Steve pulling our trailer with the ladder, fruit pickers, and tubs of fruit. A smaller bike trailer with persimmons and fruit pickers. This event we had half the group as a bicycle crew, including several trailers hauling fruit and equipment. The oak cider press we built in action. Our solid oak press on the right, and the borrowed crusher/press unit on the left. 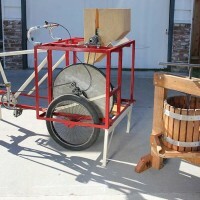 Our pedal-powered apple crusher on the left shreds up the fruit which is then pressed in the oak press on the right. This solar drier, built out of recycled materials, has preserved hundreds of pounds of fruit. Bike trailers are not commonly seen in the US, but they are known around the world as work vehicles. We’ve used a variety of trailers in the past and now own our own 8-foot long trailer made in Iowa by Bikes at Work. With this one trailer we’re able to move around our 12-foot orchard ladder, fruit pickers, and up to 4 tubs of fruit. We also use human-powered equipment to press pears and apples. 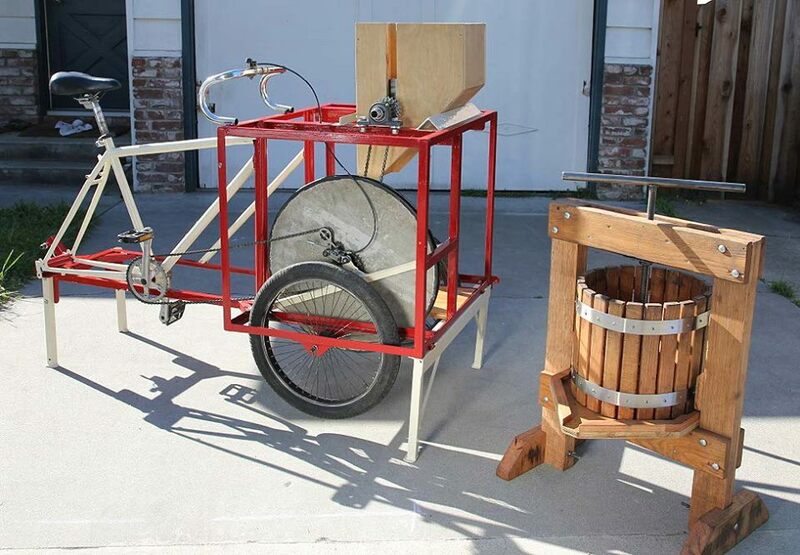 Our director Steve Schnaar and fellow Bike Church mechanic Paul Hempstead built us a pedal-powered apple crusher that pulls around like a bike trailer, then locks in place to crush up the apples for pressing. The chain drives a heavy flywheel (an old bicyle wheel filled with concrete), which keeps steady power going to the crusher, an oak cylinder with stainless steel screwheads sticking out to shred the fruit. The construction style was inspired by Steve’s visits to Maya Pedal in Guatemala, and CACITA in Mexico, which make a variety of pedal-powered machines like water pumps, corn grinders, and washing machines. The mash is then put into the oak cider press which Steve and Paul also built, using wood milled from a fallen tree in the nearby mountains, along with wood salvaged from old dorm furniture. The other setup is a borrowed machine that includes a hand-powered crusher and press in one unit. Lastly you can see the solar drier we’ve used for dehydrating plums, pears, apples, and figs, among other foods. Steve built it from an old window purchased at a salvage yard, along with wood from the scrap pile, and bicycle training wheels on one end to make it easier to move. It can take a few days to get food fully dry, but the unit has a huge capacity, and saves a lot of energy in comparison to electric driers that often draw 450 Watts or more.